Each year during winter break, Fairfield University’s Job Shadow program pairs students with alumni professionals across the country for a day of career exploration. In January, Fairfield University hosted its fifth annual Alumni Job Shadow week where 259 students shadowed 172 alumni in businesses and organizations across many industries.This year students were able to spend the day at Madison Square Garden, Gartner, Colgate Palmolive, PepsiCo, National Basketball Association, Facebook, and The Wall Street Journal. “The program helps students learn the importance of having a career network of alumni, gain first-hand information on different careers, and learn what a day is like in a specific job function or industry,” said Julie Tuozzoli ’85, manager of Employee Relations and Alumni Services, and Kim Nickolenko, director of Internships and Student Support. 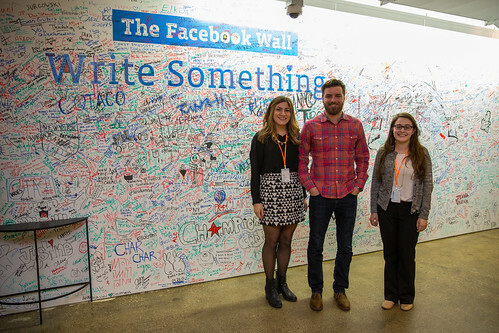 Rob Penwell ’06, a product marketing manager at Facebook, hosted two Fairfield students in New York City. The students spent the day touring the facility and speaking to Penwell and other employees about their positions at Facebook and the different marketing career paths they could take after graduation. Penwell graduated from Fairfield in 2006 with a degree in Marketing and became interested in the online marketing field after working in advertising operations at Forbes.com. At Facebook, Penwell joined the advertising operations team before transitioning over to the product marketing team. Job Shadow at Facebook | Fairfield Forward from Fairfield University on Vimeo.